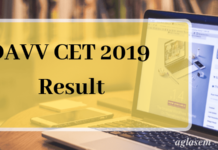 Home Universities Devi Ahilya Vishwavidyalaya DAVV CET 2019 Counselling – Check The Schedule From Here! 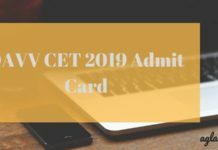 DAVV CET 2019 Counselling – Check The Schedule From Here! DAVV CET 2019 Counselling – Devi Ahilya University releases its counselling guidelines/ schedule,a long with its DAVV CET 2019 Result on its official website, www.dauniv.ac.in. Candidates who qualify for DAVV CET 2019 are then issued a counselling slip to appear in this round. Qualified candidates need to report at the centre as per the allotted date and time at the Registrar’s Office. Usually, this round commences by the first week of June. All the documents/ details provided at the time of form filling are verified and on this basis a candidate is finally allotted a seat. 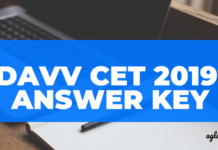 Know all about DAVV CET 2019 Counselling here. Candidates must note that, if a he/she wishes to leave the course before the last counselling date, he/she is provided with a full refund, after deduction of Rs. 1000. This is to inform to all the candidates that there will be attendance in the beginning. Therefore, candidates are advised to come in time. If any candidate reports late, his counselling will be on the availability of the seats at the time of reporting. Under exceptional circumstances, representative of the candidate (who must be his/her close relative) will be allowed in the counselling (on satisfaction about the circumstances & if the representative has authority letter from the candidate). Representative must have original & one photocopy of Photo identity card. In case of candidates having the tie in a score (having the same score), the higher rank will be determined as mentioned in CET 2019 brochure once released. Candidates may bring DD of the prescribed amount (in favor of Registration, DAVV, Indore) at the time of counselling instead of the full fee. In that case, he/she will have to deposit the difference of the fee in the concerned department within 03 working days. Insofar, Official Notification regarding DAVV CET 2019 has not been announced yet. Information on this page as per last year details. As soon as the conducting body will release the official notification the same will be updated here. Group b 2nd counseling date I want to know..
hey the second round of counselling will be start soon. is there is any seat for bachelor’s courses for 3rd counselling. till now there is no official notice on 3 round of counselling. you’ve to wait for the date to be disclosed.